We give our sincere thanks to donor who have supported these project and en-lighten these students life. Here I have attached respective project report for your reference. And also we give thanks to work coordinator of this project G.Manikandan (650) for his valuable time. India Sudar deployed 10 teachers to 10 Learning Centers in Madurai, being monitored by Thiyagam Womens Trust. Now they have sent Quarterly and Half-Yearly Mark list of the students. Please refer the attached mark list document for detail progress of the students. We sincerely Thank Thiyagam trust, Teachers, our members and Partners for all the initiatives & support. Thiyagam women trust mainly focuses on activities of disabled women. It creates self-employment for them to enhance the livelihood and addresses issues related to their rights. It also provides Academic assistance with self discipline activities and moral education to rural students of Madurai district. Indiasudar SEBLA project teachers Mr.Manimaran and Mr.Periyasamy , as resource persons trained students of a Govt Teacher Training Institute on Basic Science. They demonstrated our SEBLA experiments to them last week. Our sincere thanks to Our teachers and Mr.Gunasekaran for this arrangement and useful initiative. Special thanks to our member Mrs.K.Shanmukavadivu for the initiation and coordination. Student mark details of Tuition Training Center -Udhavum Nanbargal, Edapalayam Village, Alathur Panchayat, Palavedu Post, Chennai- 600 055 is available in the following url. 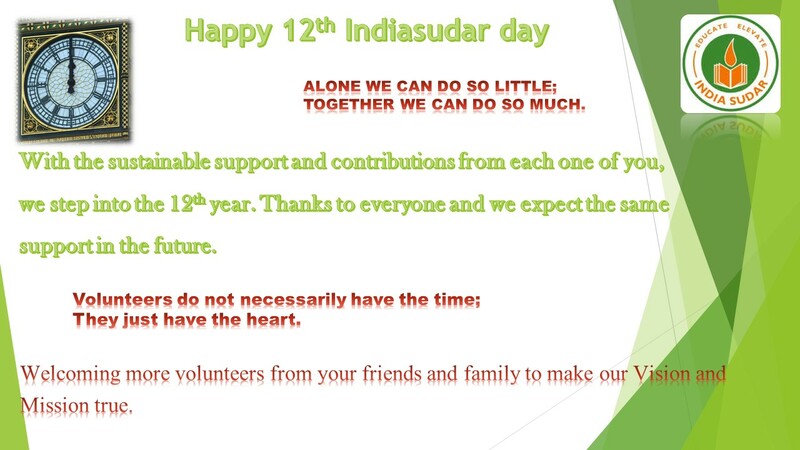 Indiasudar has deployed 5 + 2 teachers with the help of our partner organizations-Malar Trust and Helping Minds. Thanks to our partners, members and Mr.Sarathy of Udhavum Nanbargal. Udhavum Nanbargal is registered trust located in Alathur Village near by Chennai. This trust was started the noble services from the year 2004 by youth of the villages. This trust sincerely works for providing educational assistance to the students from poor family studying in and around the village.